N-Ext Air-8™ Liquid Aeration breaks up, loosens topsoil and encourages deeper rooting to drive more oxygen into the topsoil profile. 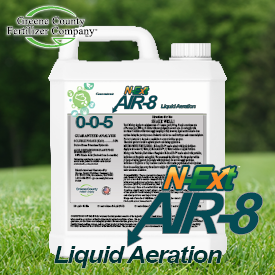 By utilizing bio-stimulants and highly oxidizing material at key growth stages, Air-8 gives the “Breakthrough” you’ve been looking for in your “Liquid Aeration” program. Mechanical Aeration addresses a small portion of the soil surface. Driving roots deeper cracks the rest of the soil and aided by powerful oxygen-adding ingredients, Air-8 provides a dynamic shift in the soil. Product intended as additive to fertilizer program. Apply spring, fall or growing season. Product safe for use on all turf types, ornamental plants. More information about the N-Ext Air-8™ Liquid Aeration is available at greenecountyfert.com.